If you need a quick, fast and easy, super simple treat to take to the office or class party, I’ve got you covered. 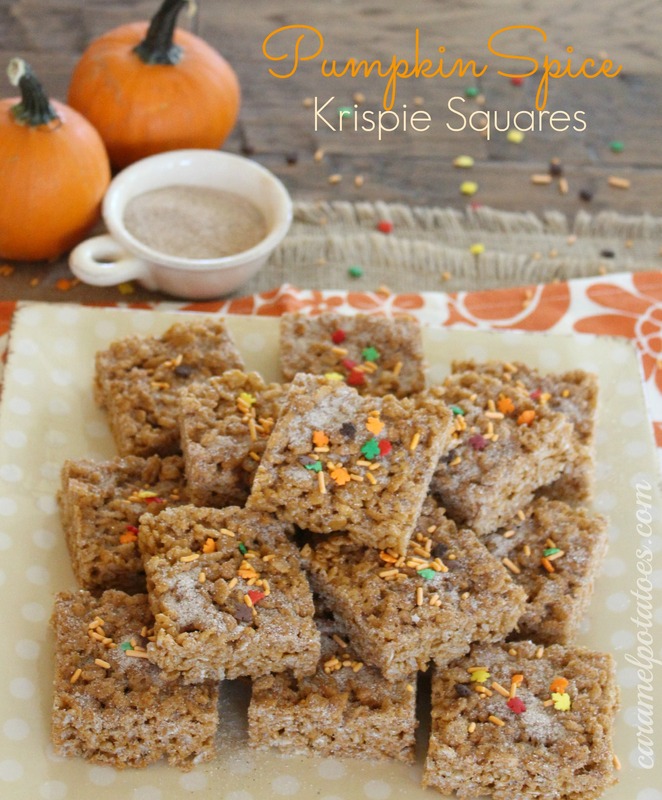 These pumpkin Spice Krispie Bars are all dressed up for Fall, but just as easy as ever. 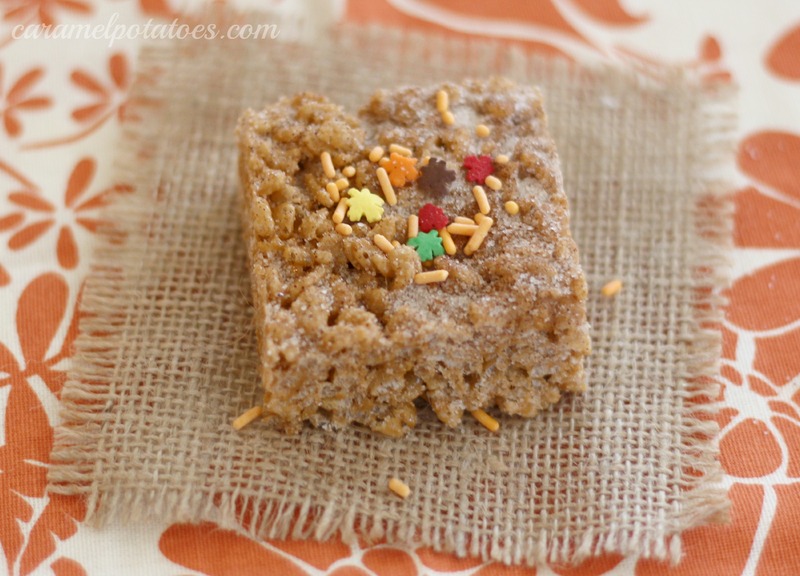 I’ve seen some recipes for pumpkin spice rice krispie bars floating around that sound pretty yummy – they involve pumpkin puree in your mix and I thought I might give them a try. 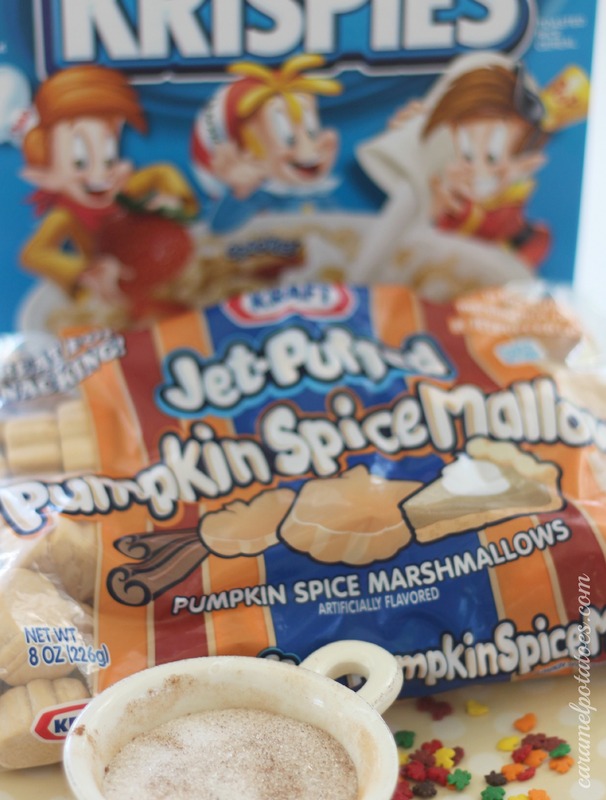 Then I was at the grocery store and saw these pumpkin spice marshmallows . . . seemed too easy, but why not? Note: The bag of pumpkin marshmallows weighs less than regular marshmallows, the recipe of the back of the bag calls for 5 cups of rice krispies, but I added the full 6 cups and thought they had plenty of gooey goodness to them. Your friends will love this fun little treat – take them into the office, or wrap them up as Halloween or Thanksgiving goodies! In large saucepan melt butter over low heat. Add marshmallows and stir until completely melted. Remove from heat. * Add Rice Krispies cereal. Stir until well coated. Using buttered spatula or wax paper evenly press mixture into 13 x 9 x 2-inch pan coated with cooking spray or butter. Combine sugar and spices and sprinkle over top of rice krispies- allow the sugar mix to fall down into the bars – do this 2 or 3 times. Note, you may not need all the sugar mix, use as little or as much as you like. 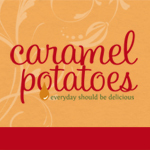 The sugar and spice mix gives these treats a sweet cinnamon taste. Top with sprinkles if desired – press them down a little to get them to stick.